It has been a busy early August for Larry and Ann Scheckel here in Tomah. Tuesday, August 8, we had our annual board meeting of the Crawford County Historical Society under the capable leadership of our affable president, Larry Quamme. Other members serving are Dennis Pelock, Sheila Champlin, Jacob Vedvik, Illene Olson, John Swanson, and John Rybarczyk, and Travis Kramer. They all do a great job. The annual board meeting is held at the Sugar Creek Valley Bible Camp i n northern Crawford County. They have all kinds of programs; swimming, hiking, horseback riding, quilting, crafts, etc. for youngsters, teens, and adults. When we held our meeting on Tuesday, there were about 100 kids enjoying the week at Bible Camp. Sugar Creek Bible Camp is open to all denominations, but it seems that Lutherans are most prevalent. We’ve had a few connections with Lutherans lately. 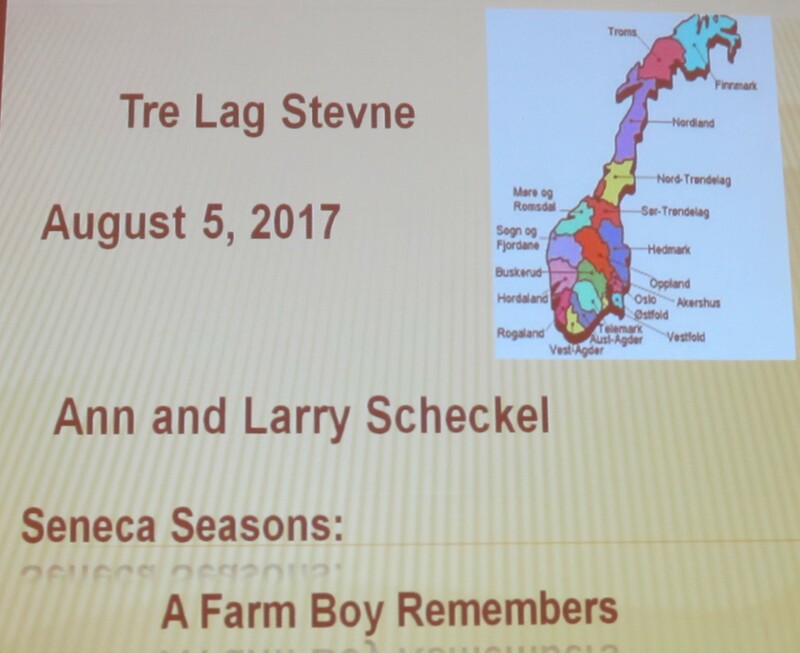 Last Saturday, Ann and I gave a presentation to the Norwegian Tre Lag Stevne conference at the Radisson Hotel in La Crosse. It was about the rural life, farming, and one-room country schools of the 1940s and 1950s. Wonderful group, warm reception, and invitations to speak to a couple of Sons of Norway groups this Fall. Then there is our St. Mary’s Cemetery here on the south edge of Tomah. We purchased grave plots decades ago and finally got the stone marker (gravestone) in place this past week. Looks mighty handsome, black granite with white lettering. All that is missing is the “end” date, and we’re in no hurry filling that in. The Catholics in St. Mary’s Cemetery are surrounded on three sides by Lutherans. The only escape is to the East along the highway. Then there is Church League softball. Tuesday night games, very low key, and both teams meet at home plate, just before the first pitch, to say a prayer. We were playing the Lutherans, and would you believe it; I pulled a right leg calf muscle running from first base to second base. I’m in a leg restraint for 2 to 4 weeks. Can’t blame it on the Lutherans; it was all my doing and the doctor suggested I might look for a sport other than softball. Twenty years ago, July 20-26, 1997, our son, Pat, and I did the RAGBRAI bicycle ride across Iowa. You dip your rear bike wheel in the Missouri River and seven days later you dip your front bike wheel in the Mississippi River. There are food stands and meals to purchase all along the route, most provided by local churches. I must say that the best cooks were those Lutherans.